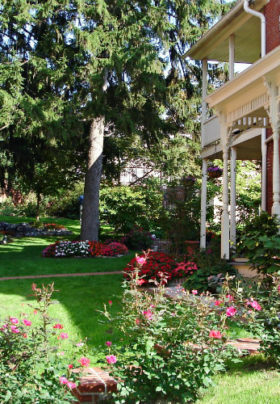 From the time you arrive in the private off-street parking lot at our Pennsylvania inn, you will be welcomed by a lovely calming garden with small waterfalls and a koi pond. Guests of the Brickhouse Inn are welcome to relax on the patios and in the gardens, which cover an area of over half an acre. The front rooms of the 1898 Victorian house and the c.1830 Welty House look out over historic Baltimore Street, but are separated from it by a lawn, beds of roses, and a wrought iron fence. Behind the two buildings is an oasis where you can relax to the sound of waterfalls on hot summer days under the shade of two tall Norway spruces and two spreading Japanese maples. We usually have plenty of flowers throughout the summer, forsythias, clematis, roses, lilies, hydrangeas and mandevilla vines.